Confused about the budget? Trust us — you’re not alone. Later this week, the House votes on several key pieces of legislation. We've created a flow chart to help keep track of the process. Confused about the state's budget? Trust us — you’re not alone. The Texas Legislature creates a spending plan every two years, but it takes almost as much time to prepare that plan. This session, lawmakers will set a budget that will be implemented in fiscal years 2012 and 2013 (Sept. 1, 2011, to Aug. 31, 2012). This week, House members will be tested when they vote on their version of a general appropriations bill. Lawmakers are considering unprecedented cuts in every area of state spending, from public education and health services to public safety. Below is a flow chart to help you understand where we are in the process (highlighted in yellow) and what steps are next (highlighted in gray). If you click on the boxes, you'll see we’ve linked to the applicable web sites and documents so that you can take a look for yourself at the bills being considered. 1. Texas is constitutionally mandated to balance its budget, which means lawmakers are not allowed to spend more than what the state generates in revenue. This means they’re left with three options: cut the budget, raise taxes or go for a combination of both. So far, the GOP majority has expressed serious doubts and has in some cases outright pledged to not consider any kind of revenue enhancement measures. 2. The Legislature is charged with balancing the budget for the current biennium (Sept. 1, 2010, to Aug. 31, 2011) before it can work on the next biennium’s budget. On Thursday, the House will vote on HB 4 and HB 275, which deal directly with closing the 2011 deficit and authorizing a withdrawal from the Rainy Day Fund. On Friday, members are scheduled to vote on HB 1, the general appropriations budget for 2012 and 2013. Meanwhile, the Senate is working on its own version of the bill. See the chart to understand how it works. 3. Watch Comptroller Susan Combs. In January, Combs released the Biennial Revenue Estimate, which forecasts the state’s revenue collections. She updates lawmakers on those numbers as they change. Right now, they’re hanging on her every word because every dollar she can find in revenue means fewer cuts going ahead. Her words have power. In early March, Combs told lawmakers the state will not be able to pay its bills through August without dipping into the Rainy Day Fund. 5. To wrap it up, the House is voting on three major bills this week. HB 4 is a supplemental bill that will make permanent the cuts implemented during the last biennium in addition to other decreases. HB 275 will authorize the House to withdraw from the Rainy Day Fund. HB 1 is the general appropriations bill for the next two years. You will likely see support (along party lines) for HB 4, widespread support for HB 275 and a long debate over HB 1 and whether it is an adequate budget that meets the needs of the state. It’s not too late to have your voice heard. Engage in the process by contacting your lawmakers (we’ve made it easier for you with our directory). Share your thoughts below. The Tribune will be following the House votes on HB 4, HB 275 and HB 1 on Thursday and Friday. 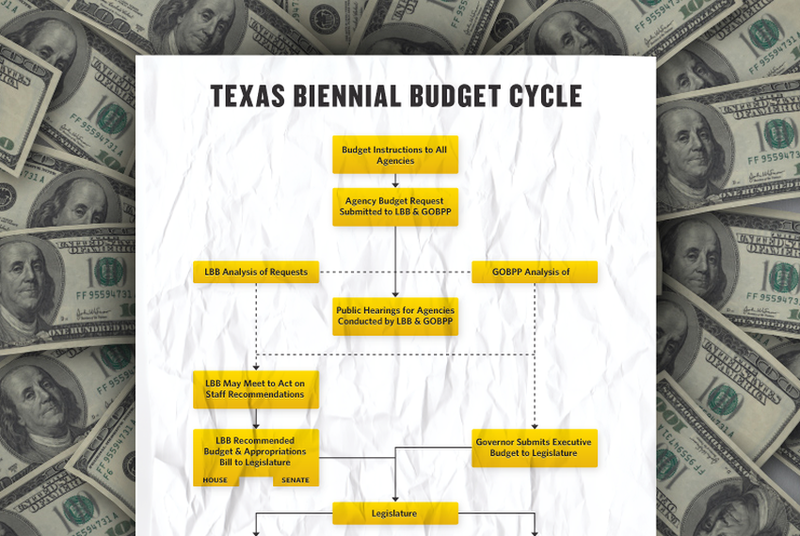 For more information about the budget cycle, read the Senate Research Center's Budget 101: A Guide to the Budget Process in Texas.